Mountain Mods Monticle 24 - CYO (choose your own) utilizes the same high grade aluminum as our other all Aluminum Chassis and stands 18 inches tall, 24 inches deep, and 9 inches wide. The expansive space allows for loads of components including water cooling equipment in the shape of a tower. The Monticle incorporates our patent pending "Hyper Modular" design. With the "Hyper Modular" design you can rotate front or back panel 180 degrees as well as interchange side panels. The Motherboard tray can also be rotated 180 degrees to put your system into Reverse ATX mode. Just swap the security flange of the motherboard tray to the opposite side. Choose from a variety of top and side panels, as well as a variety of finishes, and acrylic colors. The Monticle is fabricated by skilled workers in the USA. It is made from thick aluminum making it lightweight, sturdy, and thermally friendly. Assembly INSTRUCTIONS same as the U2-UFO. Does not include same parts! 5.25 Devices - Holds 3. 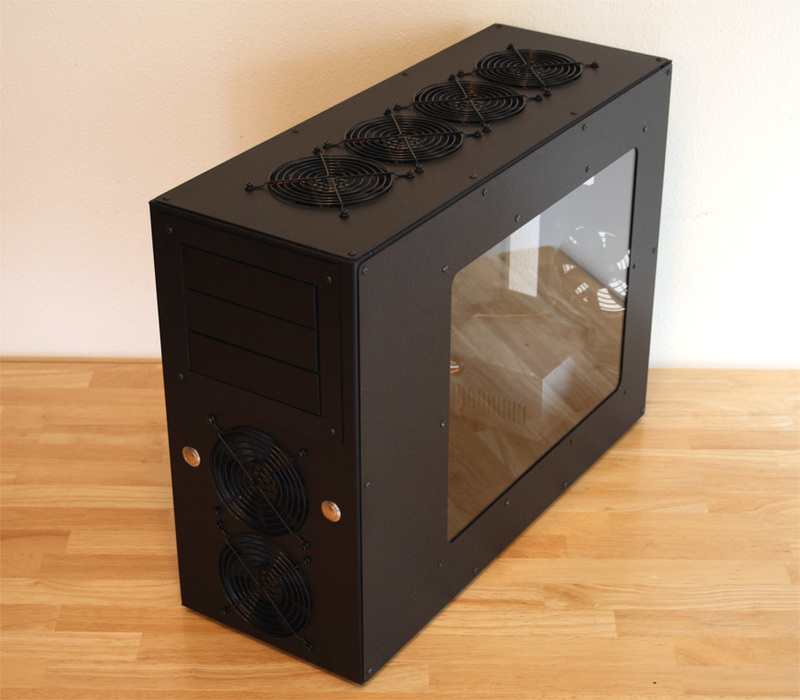 Photo images show: Finish - Anodized Black, Big Window Side 2, Solid ALU side1, Quad side3 (top). Image shows Monticle in reverse ATX configuration. Monticle can also run reverse ATX with MB tray on the floor. Pictures show versatility of Hyper Modularity.